One in three adults experience anxiety or have a genuine fear of air travel, but flying does not need to incite concern. If a charter guest or aircraft owner knows what standards of safety and records of excellence have been met, maintained and surpassed, clients can fly with peace of mind. Not all private aircraft operators are created equal, and for that reason, it is important to ask questions and know what to look for regarding a private aviation company’s safety record. Corporate aviation businesses can opt to obtain additional symbols of safety that surpass the FAA’s necessary requirements. In business aviation, there are three high-level standards of safety: IS-BAO, ARGUS and WYVERN. These three organizations are the world’s most recognized safety auditing institutions and acknowledge private aviation companies based on the level of safety achieved. Clay Lacy Aviation ranks amongst the leading private jet operators for achieving the highest aviation safety ratings in the industry. IS-BAO, or International Standard for Business Aircraft Operations, has three stages of safety auditing that corporate jet companies may pursue. Stage 3, the highest level and the current rating for Clay Lacy Aviation, indicates that safety management systems are thoroughly ingrained in the company’s culture and will be sustained over time. Relevant to the safety culture at any company is an attitude of ongoing excellence and awareness. “Safety is a continuous and evolving process; one where we are constantly exploring new ways to improve,” says Ryan. 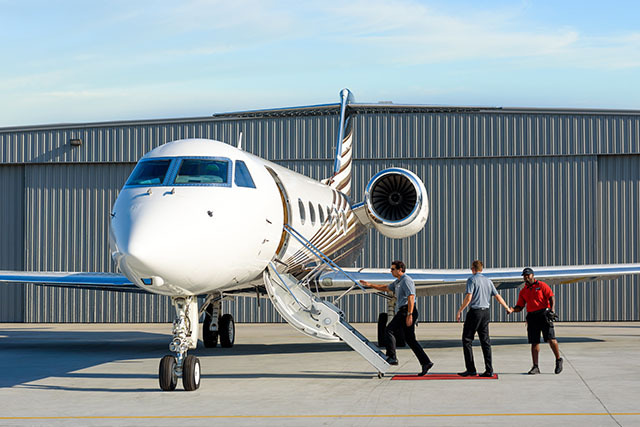 To determine if a company is IS-BAO certified, and at what stage of safety, charter guests and owners should inquire with the the private jet operator directly or check the company’s website. The ARGUS Platinum and WYVERN Wingman safety symbols are highly respected within business aviation. ARGUS is the most requested symbol of quality for private jet operators and the platinum rating— which Clay Lacy Aviation holds— is the highest certification provided. To verify the ARGUS rating of a private jet operator, charter clients can refer to the ARGUS website. For further information, a TripCheq can be requested that provides information about a specific crew and plane. Recognized WYVERN Wingman Operators increase their visibility as an organization which places a high value on the safety of their employees and clientele. Notably, Clay Lacy Aviation has held the WYVERN Wingman safety rating longer than any other operator in the world. WYVERN publishes a report called ‘The Wingman Report’— which is a resource for risk-averse corporate clients, brokers and end users. Clay Lacy Aviation has held the WYVERN Wingman safety rating longer than any other private jet operator in the world. It is important that a private jet operator procure globally recognized safety ratings, along with displaying a dedication to creating a positive safety environment. At Clay Lacy, clients will travel with certainty, knowing that they are with the industry’s best. How does Clay Lacy find the most experienced and safest in-flight professionals for your aircraft? Click here for insight into how our private jets are crewed.